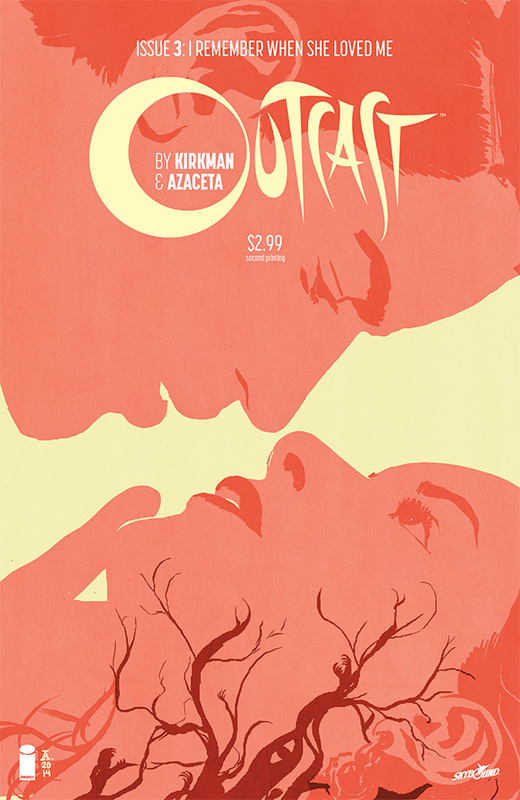 Outcast by Robert Kirkman and Paul Azaceta is quite the hit. Such a hit that the third issue has sold out instantly and is slated for a second printing. The book celebrates the somber, terror-riddled tones of the classic horror genre and is winning over comic readers in droves. Robert Kirkman and Fox International Channels announced during San Diego Comic-Con that Cinemax has green-lit the pilot for Outcast and that further updates on production will be released soon. Outcast explores demonic possession and exorcism while telling the story of Kyle Barnes, a man with a burdensome gift. In issue #3, details of Kyle's life, in the time before he returned to Rome, West Virginia, are revealed... as the danger from all around him intensifies. Outcast #3 will go into a second printing in order to meet customer demand. For fans of digital editions, this third issue remains available for purchase across all platforms, including the Image Comics website (imagecomics.com) the official Image Comics iOS app, Comixology’s website (comixology.com), iOS, Android, and Google Play. This second printing of Outcast #3 (Diamond Code JUL148428) will be available on September 24. Outcast #4 (Diamond Code JUL140566) will hit shelves on September 24. Full press release below.